Prices have fallen by a quarter since the market peaked in April. A real estate sign stands in front of a house in Vaughan, a suburb in Toronto, Canada, May 24, 2017. Many market analysts have declared that the party's over in Toronto's real estate market. Nowhere is that clearer than in the city's detached home market, where the average price has fallen by nearly $400,000 in the space of four months. An average single-family home in the city of Toronto went for $1.191 million in August, the city's real estate board reported Wednesday. 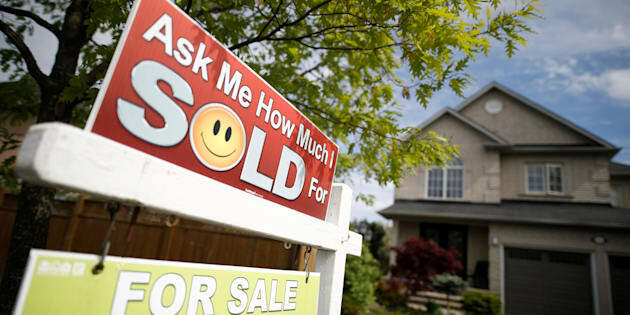 That's a drop of nearly $388,000, or 24.5 per cent, since April, when Ontario's government announced a new foreign speculators' tax and other measures meant to cool the housing market. The price of a detached home in Toronto is now 1.2 per cent lower than it was a year ago. Detached-home prices in Toronto's suburban 905 region are also falling, down 19.3 per cent since they peaked in March, to $906,592 on average. Overall, the data paint a picture of a significantly softer housing market than was the case just several months ago. Sales were down 34.8 per cent in August, compared to the same month a year ago. What's unknown, at this point, is whether this correction will worsen, or whether the market will bounce back. Many analysts point to the fact that Vancouver's market is starting to look up, after a year of slumping sales and prices, suggesting Toronto may follow in the same footsteps. Condo prices have held up much better in the recent slump. The average price in Greater Toronto was $507,841 in August, a drop of 6.2 per cent from its peak in April. What this means is that, for the first time in many years, the gap between condo prices and detached house prices is shrinking, making it easier — if not easy — for homeowners to upgrade. After years of relentless growth, the gap between house prices and condo prices in Toronto has begun to shrink. But whether or not that continues is an open question. "At the height of the market mania this year, a condo owner wanting to trade up to a detached single-family house would need to scrape together or borrow more than $500,000, compared with less than $100,000 at the start of the century," commented Bank of Montreal economist Sal Guatieri, in a recent client note. "While this spread has narrowed to $441,000 in July, it's still wide enough to persuade many condo owners to stay put ... hoping that detached prices will fall further." But Guatieri had a word of caution for those playing the waiting game: "The same price differential in Greater Vancouver (a cool $1 million) is surprisingly on the rise again after last year's correction in the detached-home market."